Our little garden is going crazy with all this hot weather. 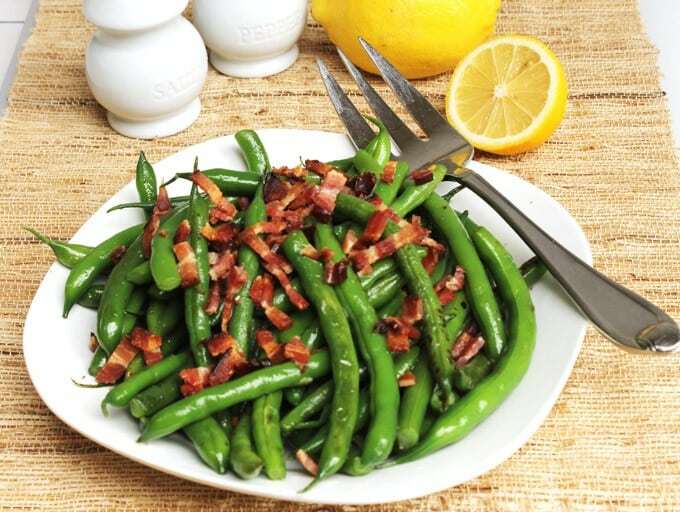 I just picked a nice basket of green beans and made this side dish of green beans with bacon crumbles for our dinner. We don’t have a very big garden but it has some chard, kale, three kinds of squash and the beans. Every year I also plant tomatoes and every year I am disappointed as our little patch of garden doesn’t get enough hot sun to ripen them. This year I decided not to struggle with them and naturally, we had week after week of really hot weather. 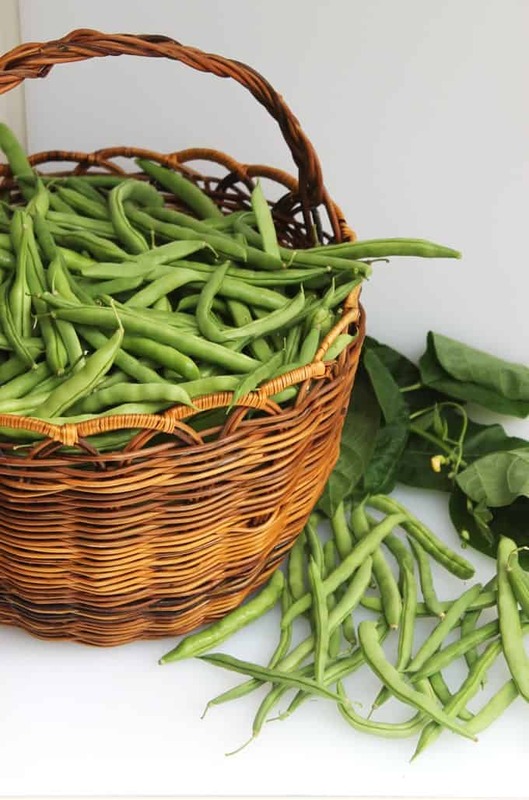 Oh, well….I planted several rows of green beans and I made sure I bought the ‘stringless’ variety as there is no way I am going to spend any time pulling strings off of them. The green beans are the stars in my garden as they always do well and we have been enjoying them in different ways. Last year I over-planted and had a bumper crop. 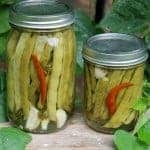 We still have a few jars of the hot dilly green beans in the garage closet. 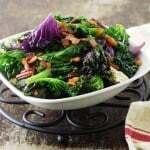 This recipe is easy and delicious and if you have some pre-cooked bacon left over from breakfast it is even easier. There are several ways to cook bacon and The Kitchen gives some examples. I like baking my bacon on a rack in the oven as it is easier than the stove top fry-pan method and I don’t have to stand there turning it. We like our green beans nice and tender-crisp and still a pretty bright green. To get them that way I put them in a pot of salted boiling water for four minutes. Next, I drain them and plunge them into a pan of ice water to stop the cooking process. When they have cooled, I drain them and put them on a kitchen towel and blot the water off. At this point they can be set aside and sautéed just before serving. 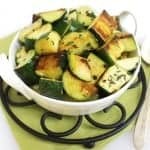 That is a great time saver and can be done even a day before and refrigerated until you are ready to finish the cooking process and serve them. It only takes a few minutes to finish these green beans with bacon crumbles for serving. A little sprinkling of red pepper flakes gives the beans some zip. Also, I really like the flavor that coconut oil adds but still, some of the bacon drippings rather than the oil would be very good as well. Top it all off with the bacon crumbles and serve! 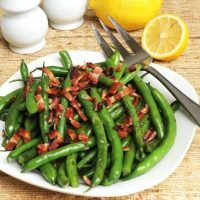 A side dish recipe for green beans with bacon crumbles that has a little zip of red pepper flakes. The green beans are crisp and tender but still bright green. Line a baking sheet with foil (this makes clean-up easy) and set a wire rack over it. Spray the rack with non-stick and place the bacon slices on the rack. Bake for 15 minutes, remove from the oven and flip the slices over and continue to bake for another 5-10 minutes. This will depend on how thick your bacon is and how crisp you like it. Remove from the oven and transfer the slices to a paper-towel lined plate. When cool cut into crumbles and reserve. Fill a large pot with salted water and bring it to a full boil. 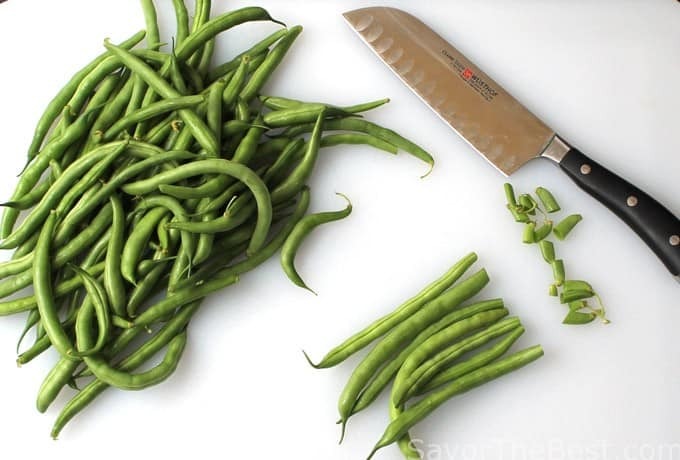 Meanwhile, rinse the green beans under cold water to remove any debris, drain them and snap or cut off the stems. Prepare another pot of water with ice water and reserve. When the pot of water begins to boil, add the green beans and boil for 4 minutes. Carefully, drain the hot water off the green beans through a colander and immediately plunge them into the reserved ice water bath. This will stop the cooking process and allow the green beans to remain bright green. When the beans have cooled in the ice water, drain them in the colander and spread them out on a kitchen towel to drain. Blot off any remaining water before cooking. 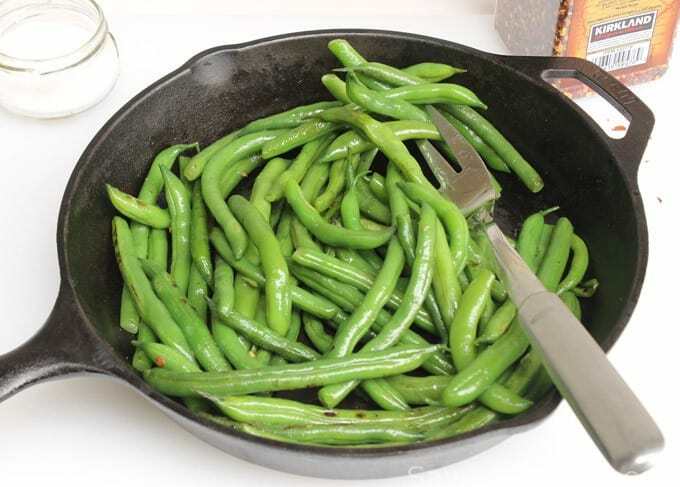 In a heavy-bottomed skillet, over medium-high heat, add the oil and the red pepper flakes, when the oil has melted add the green beans tossing to coat each one. Cook the beans, tossing and stirring continually, just until they are crisp-tender. 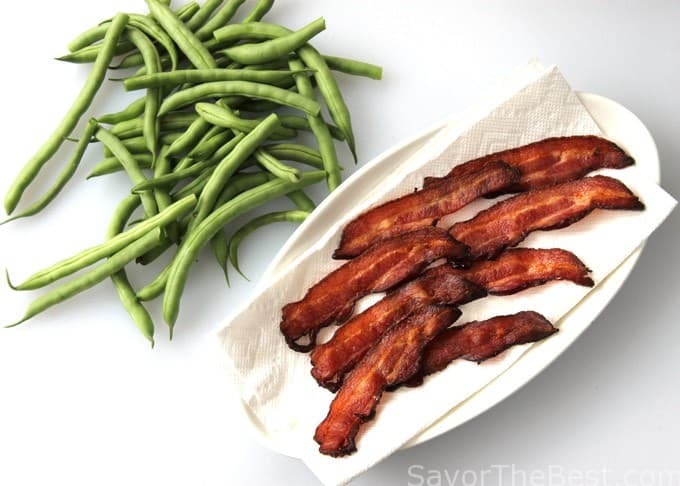 Transfer the green beans to a serving dish and sprinkle the reserved bacon crumbles on top. It got too hot for out tomatoes this year — the vines got fried, alas, so our crop wasn’t that good. Anyway, love green beans! Don’t they combine so well with bacon? This looks terrific — thanks! Thanks, John…:) The bacon is delicious with these beans.